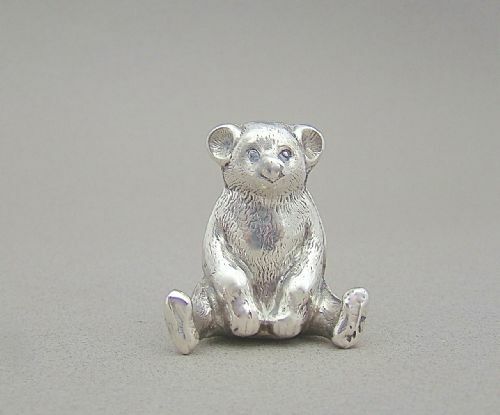 This is a truly delightful and very collectable pin cushion in the form of a seated teddy bear. It is dated Chester 1909 and bears the hallmarks of the BOots Pure Drug Company. The back fitted with then original purple velvet cushion. Date letter "l" for 1909. Silver casing and cushion in very good condition. Sits firmly on its legs. This delightful and very collectable silver mounted pin cushion was made by the prolific Levi & Salaman and is dated Birmingham 1906. 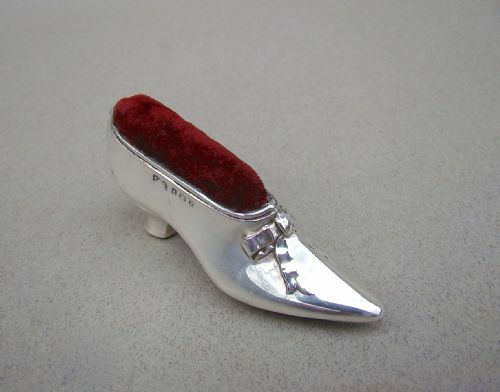 The silver casing realistically modelled as a ladies’shoe. Fitted with a red velvet cushion. Length: 7cm / 2.6 inches. Maximum width: 2cm / 0.6 inches. Maximum height: 3cm / 1.2 inches. 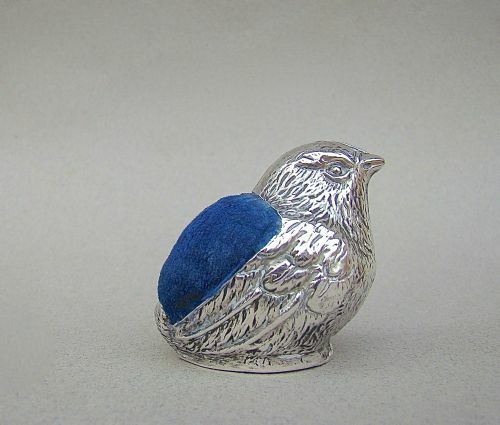 This delightful solid silver "fledgling" chick pin cushion is more unusual than the "hatching" chick pin cushion design, it bears the marks of William Hair Haseler and is dated Birmingham 1905. Detailed plumage resting on an oval solid silver base, with the chick's back being the cushion. Finished in the original navy blue velvet. W.H.H for William Hair Haseler. Date letter "f" for 1906. Velvet in very good condition. Length tail to beak: 5cm / 2 inches. This unusual and amusing novelty quaich pin cushion was made by the renowned Hamilton & Inches and is dated Edinburgh 1902. Of typical twin-handled form with lug handles and circular pedestal foot. Fitted with a blue velvet cushion. H&I for Hamilton & Inches. Length across handles: 6cm / 2.3 inches. Bowl diameter: 4cm / 1.4 inches. 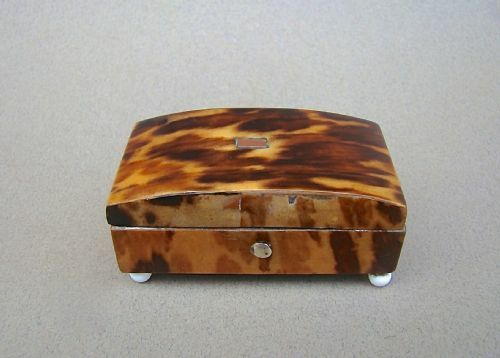 This delightful mid 19th Century tortoiseshell casket is designed to hold sewing pins. The domed hinged cover inlaid with a small copper rectangular reserve. The front with a silver button. The base raised on four ivory feet. Original silver paper interior. Length: 6.5cm / 2.3 inches. Width: 5cm / 2 inches. Height: 3cm / 1.1 inch. Very good condition for its age. Very little loss to the tortoiseshell, just minute loss on edge of front cover. Original interior in good condition. This rare solid silver saccharin dispenser is fully hallmarked for William Vale & Sons and dated Birmingham 1917. Of plain cylindrical form. The pull-off lid incorporating a sliding mechanism, dispensing individual saccharin pills. W.V&S for William Vale & Sons. Date letter "s" for 1917. Diameter: 0.7cm / 0.2 inch. Minor ding on one corner. Postage overseas: £8 International Signed For. This delightful silver novelty pin cushion was made by the prolific Adie & Lovekin and is dated Birmingham 1922. Modelled as a wheel barrow, with an articulated wheel and fitted with a dark blue velvet cushion. ALLD for Adie & Lovekin. Date letter "x" for 1922. Width: 2cm / 0.3 inch. Height: 3cm / 1.3 inches. Silver wheel barrow and cushion in excellent condition. Articulated wheel in functioning order. 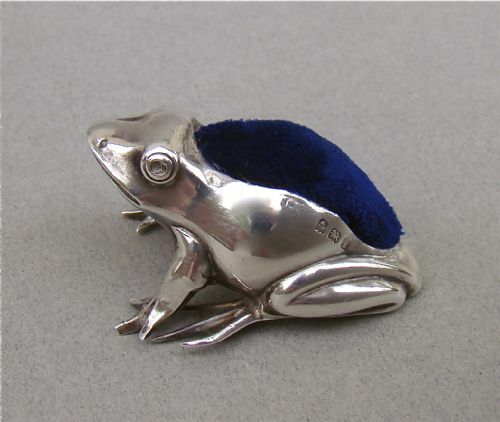 This delightful Edwardian silver novelty frog pin cushion was made by the prolific Adie & Lovekin and is dated Birmingham 1910. 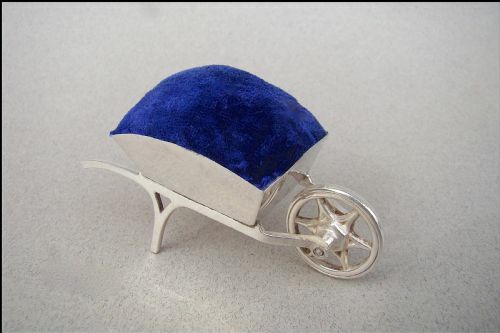 Modelled as a frog, with an articulated wheel and fitted with the blue velvet cushion. AL&L for Adie & Lovekin. Date letter "l" for 1910. Length: 4.5cm / 1.4 inches. Width: 2.5cm / 1 inch. Height: 2cm / 0.6 inches. Maker's marks slightly rubbed but identifiable. 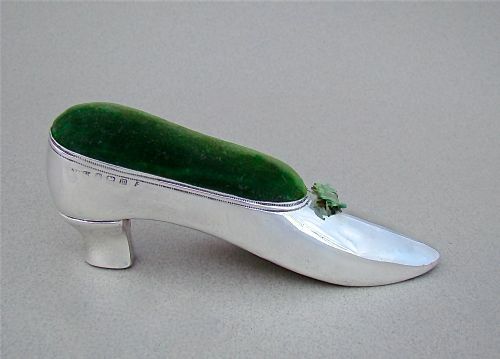 This rare and fabulous sterling silver pin cushion in the form of a ladies' shoe has a very good size, measuring over 5"" long. 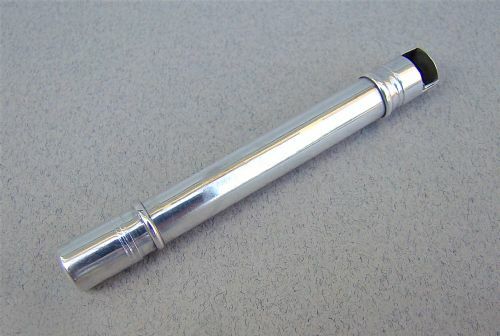 The elongated plain silver body with bright-engraved border and patent number. The casing fitted with the original green velvet and the front with green original green satin bow. The sole is beautifully crafted with light oak and the heel is rather elegant. S.B & S. Ltd for S Blanckensee & Sons. Length: 13cm / 5 inches. Height: 5cm / 2 inches. 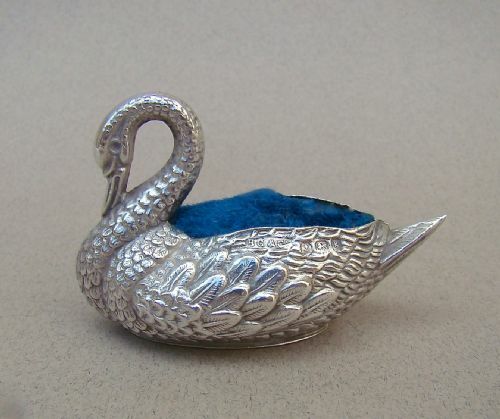 This delighful silver swan pin cushion bears the marks of Britton Gould & Co and is dated Birmingham 1906. The body with detailed plumage rests on an oval silver base, the cushion finished in teal velvet. BG&Co for Britton Gould &Co. Date letter "k" for 1906. Length: 6cm / 2.2 inches. Width: 2.5cm / 1 inches. 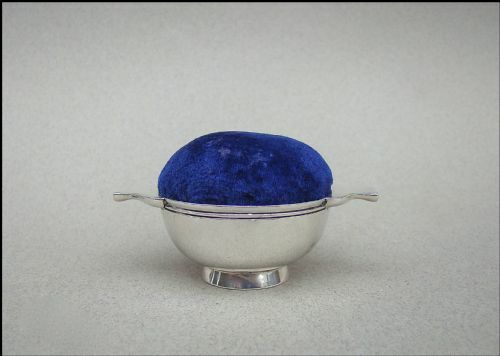 This rare silver mounted pin cushion was made by the prolific Samuel M Levi and is dated Birmingham 1909. 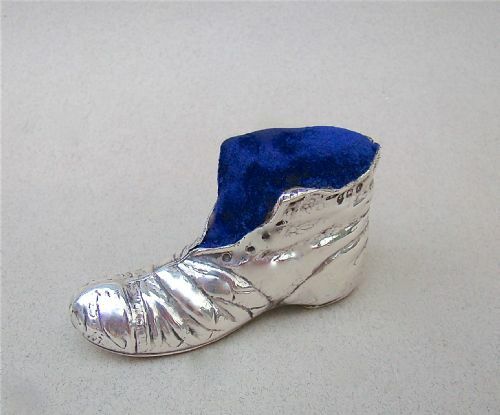 The silver casing realistically modelled as a leather boot. Fitted with a blue velvet cushion. The side impressed with patent number. S.M.L for Samuel M Levi. Date letter "t" for 1918. Width: 2cm / 0.6 inches. 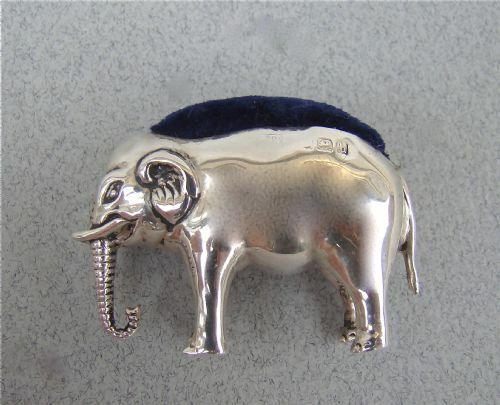 This is a wonderful novelty silver pin cushion in the from of an elephant, always a very popular subject. It is in very good condition. Fitted with its original blue velvet cushion. A&LL for Adie & Lovekin. Date letter "h" for 1907. Length up to tail: 4cm / 1.6 inches.